Mixed reviews for fourth film “The First Purge” can’t extinguish our excitement for the franchise’s transition to the small screen. USA and Blumhouse are bringing 10 episodes of “The Purge” to TV, with the debut slated for September 4th at 10pm. 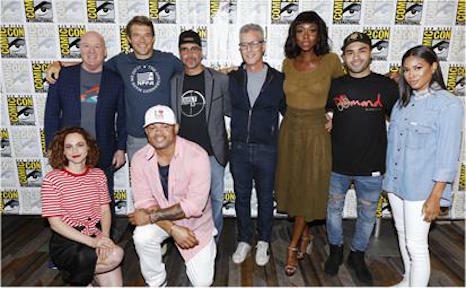 The creative team’s SDCC panel included appearances by producer Jason Blum and "Purge mastermind James DeMonaco as well as stars Fiona Dourif, Amanda Warren, and more. Even more exciting than that, “The Purge” took over a corner of downtown San Diego during the convention for a pop-up shop of Purge Night supplies. Purgers patronizing the activation can stock up on essentials in an immersive experience located right next to Petco Park. We can tell you from experience that it’s a popular spot, so stake out a spot as quick as you can to get through the line. Purge City will be open during event hours all weekend long. “The Simpsons” creator and Comic-Con fixture Matt Groening brought the voice cast and producers behind his new animated series “Disenchantment” to SDCC with the tease “a princess, an elf, and a demon walk into a bar…” Groening proved his artistic chops are as sharp as ever as he displayed hand-drawn sketches of the show’s colorful characters, who of course bear more than a passing resemblance to their yellow-skinned relatives from Springfield. 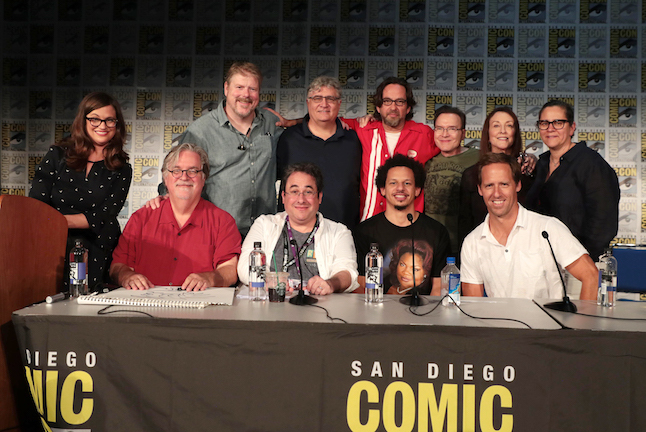 Allie Goertz (MAD Magazine/Everything’s Coming Up Simpson podcast) moderated the panel discussion with Matt Groening, showrunner Josh Weinstein and cast Eric Andre, Nat Faxon, John DiMaggio, Billy West, Maurice LaMarche, Tress MacNeille, and David Herman along with Claudia Katz from Rough Draft animation studio. In the 10-episode comedy fantasy series aimed at adults, viewers will be whisked away to the crumbling medieval kingdom of Dreamland, where they will follow the misadventures of hard-drinking young princess Bean, her feisty elf companion Elfo, and her personal demon Luci. Along the way, the oddball trio will encounter ogres, sprites, harpies, imps, trolls, walruses, and lots of human fools. July 22, 2018 by Ian Sedensky.